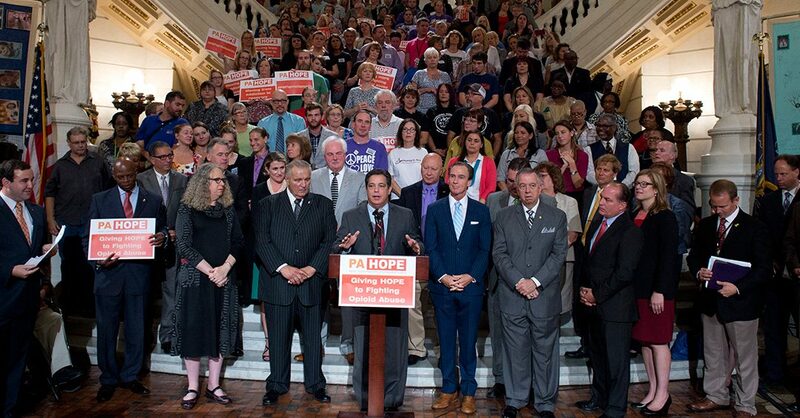 HARRISBURG, Sept. 20 – Calling for funding, support and educational efforts to combat Pennsylvania’s growing opioid epidemic, state Rep. Ed Gainey today joined his colleagues from the legislative PA HOPE Caucus, Gov. Tom Wolf, Lt. Gov. Mike Stack, administration officials, advocates and families for a “Day of HOPE” rally in the state Capitol Rotunda. “The drug culture is having an effect on everyone – from people living in cities to those in rural areas, from young people to older adults. It’s having devastating consequences and we all recognize that it requires a comprehensive effort to move people from addiction to recovery, which is the core mission of the PA HOPE Caucus,” said Gainey, D-Allegheny, one of four co-chairmen of the bipartisan, bicameral organization which stands for Heroin, Opioid Prevention and Education. “We must do everything possible to keep people alive and offer them hope for their future. Nobody should have to go down this road alone and we must stand with them as a commonwealth, as a community and as caring human beings. “Education is also vitally important to our cause so people know how they can get help for themselves and for their loved ones. Without education and true champions on this issue, there is only ignorance and ignorance leaves no room for hope. We need hope,” Gainey said. Gainey encourages anyone with an addiction, or family member or friend who is addicted, to visit the Commonwealth Prevention Alliance Campaign to Stop Opiate Abuse at pastop.org or www.pa.gov/collections/opioid-epidemic/. In addition to several legislators, others participating in the rally included Gary Tennis, secretary, state Department of Drug and Alcohol Programs; Pennsylvania Physician General Rachel Levine; Bill Stauffer, executive director, PA Recovery Organization Alliance; and Deb Beck, president, Drug & Alcohol Service Providers Organization of PA.
To learn more about the PA HOPE Caucus, visit www.PaHOPECaucus.com.